Stunning Riverview Estate. 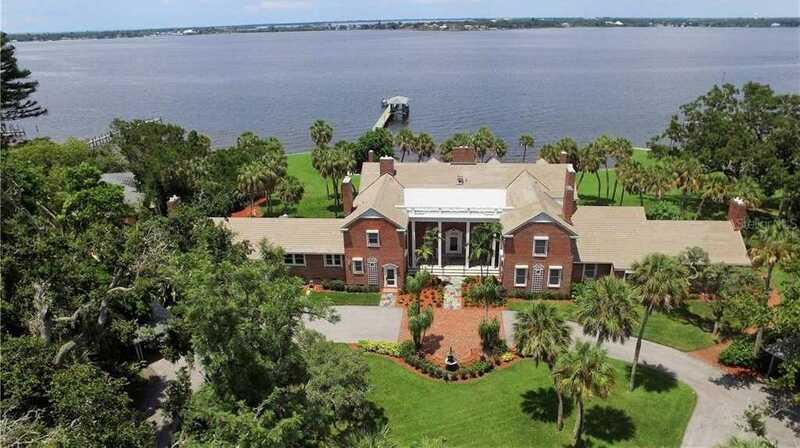 Spectacular views of Manatee River abound in this impressive home and expansive grounds built and owned by E.E. Bishop. An example of historical Colonial style Georgian Homes inspired by King George I & III in 18th century England. 3+ acres of land on a 25 8217; bluff above the river. The Georgian style shows on the entrance w/ Ionic style pilasters complete with entablatures & pediment. Also, roof balustrade, hyphens, hip roof with 4 dormers & many chimneys. Walk into the Grand Foyer and begin to see the intricate wood carved workmanship on ceilings, walls, moldings and fireplaces. Also, vast dining, catering, & Sun rooms. Continue to the west wing including massive kitchen w/ Sub-Zero fridge, 6 burner gas stove w/ grill, pantry with additional fridge & freezer, the flower room, nanny 8217;s room, 2nd stairway & elevator. The east wing can be closed off for privacy w/ outside entrance. Includes the grand staircase, library, access to finished basement, master BR w/2 baths, impressive closet, guest BR with bath, the Garden Room with kitchenette. Go up the main Majestic Staircase to 2nd floor w/ 6 BR 8217;s, 6 Baths, playroom, access to east attic & dormers area. The home is adorned with a total of 10 fireplaces, 8 bedrooms (potential for more) & 10 189; Baths. New tile roof in 2017 w/ hurricane quality hardware. The dock is 8 ft. wide, over 300 ft. long w/ covered boat slip, lift, and 20 x 20 terminus. The home is a must see for those with appreciation of elements of fine craftsmanship! Please, send me more information on this property: MLS# A4408263 – $4,900,000 – 4820 Riverview Blvd, Bradenton, FL 34209.